* Drawing on the wide and deep body of knowledge that the authors acquired in the process of producing the 'FORTUNE 100 Best Companies to Work For' ranking, top consultants Michael Burchell and Jennifer Robin reveal what separates the great from the good companies to work for. '...a truly inspirational business book -- accessible, easy on the jargon and full of creativity...packed full of great case studies.' (Talent Engagement Review, March 2011). 'Written in an informative, straightforward way...puts engagement and the culture of camaraderie into context for large and small organizations.' (HR Magazine, June 2011). Michael Burchell, Ed.D., is a corporate vice president with the Great Place to Work Institute and a partner in the Institute's UAE affiliate. A sought-after speaker at conferences around the world, he has worked with senior leaders in positioning the workplace as a competitive business advantage. Jennifer Robin, Ph.D., is a research fellow at the Great Place to Work Institute. A former consultant with the Institute, she currently teaches in undergraduate, master's, and professional programs at Bradley University. The Great Place to Work Institute is a global research and consulting firm with forty affiliates around the world. The Institute produces the FORTUNE 100 Best Companies to Work For Annual List and the Best Small & Medium Companies to Work For in America lists, in addition to thirty-eight best companies lists internationally. Based on research conducted by the Great Place to Work Institute, "The Great Workplace" explains the concept of a Great Place to Work and demystifies the Institute's Great Place to Work model. Companies featured include General Mills, Google, and Microsoft. 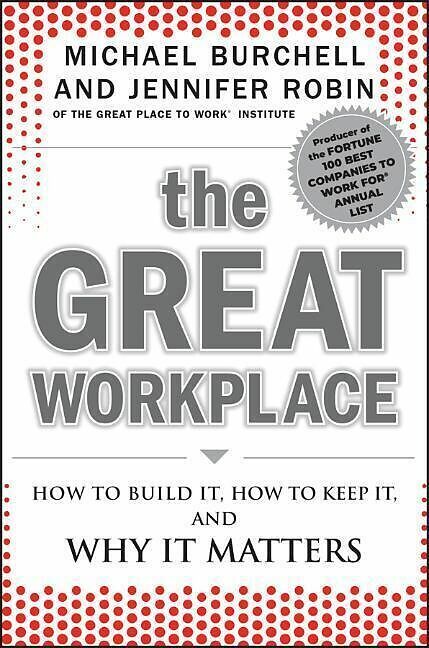 Gold Medal Winner, Human Resources and Employee Training, 2012 Axiom Business Book Awards Trust, Pride and Camaraderie transform your company into a "Great Place to Work" The Great Place to Work Institute develops the annual ranking of the Fortune 100 Best Companies to Work For. Foreword (Robert Levering). Preface. 1 Introduction: The Value of Creating Great Workplaces. SAS: Taking Care of Their Greatest Asset. 2 Credibility: "I Believe in My Leaders." PricewaterhouseCoopers LLP: Inspiring Excellence. Google: Finding the Googlers in a Very Large Haystack. 3 Respect: "I Am a Valued Member of this Organization." General Mills: Developing Great Managers. SC Johnson: A Family Company. 4 Fairness: "Everyone Plays by the Same Rules." Scripps Health: All for One and One for All. CH2M HILL: Ownership as a Way of Life. 5 Pride: "I Contribute to Something Really Meaningful." Wegmans Food Markets: Proud of Their Contributions to Communities. W. L. Gore & Associates: An Innovative Culture and a Culture for Innovation. 6 Camaraderie: "The People Here are Great!" Camden Property Trust: Building a Fun Community for Employees and Residents Microsoft: Geniuses Welcome. 7 Global Perspectives: Great Workplaces Around the World. 8 Taking Action: Creating Your Great Workplace. References and Resources. Acknowledgments. About the Authors. Index.